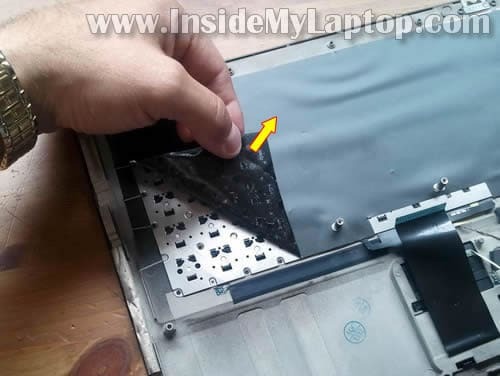 In this guide I explain how to disassemble an HP ENVY 15 notebook. My goal is removing and replacing failed keyboard (a few keys stopped working). 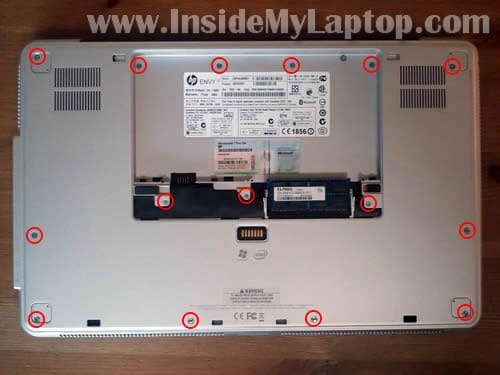 Before you start taking it apart, make sure the computer is turned off and battery removed. Remove three screws securing the memory cover. Remove four rubber feet. They are glued to the bottom case with double sticky tape. Now you can lift up and separate the top cover assembly from the base. Be careful. There are cables connecting the top cover assembly to the motherboard. You’ll have to disconnect those cables before removing the top cover assembly. 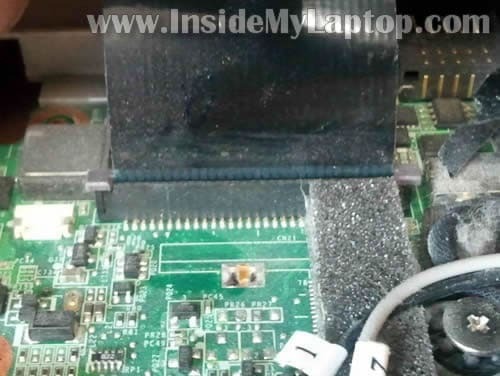 Unplug the LED board cable connector from the motherboard. 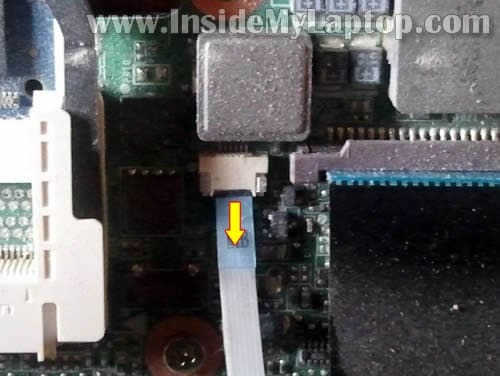 Pull the touchpad cable from the connector on the motherboard. This connector has no locking mechanism. In order to remove the keyboard cable you’ll have to unlock the connector first. On the following picture the connector is shown in the locked position. 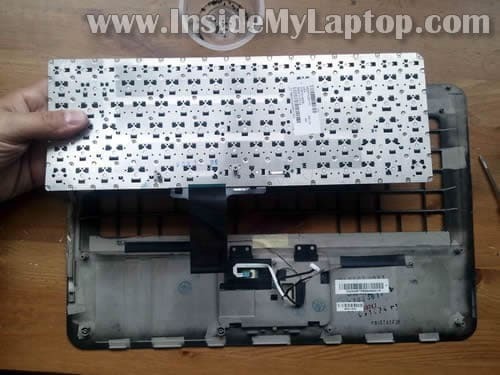 Very carefully lift up the brown locking tab about 2-3 millimeters. The locking tab must stay attached to the connector base. After all cables I mentioned in the step 6 are disconnected, you can remove the top cover assembly. – All internal memory modules/slots. HP ENVY 15 has four memory slots. – All three cooling fans. 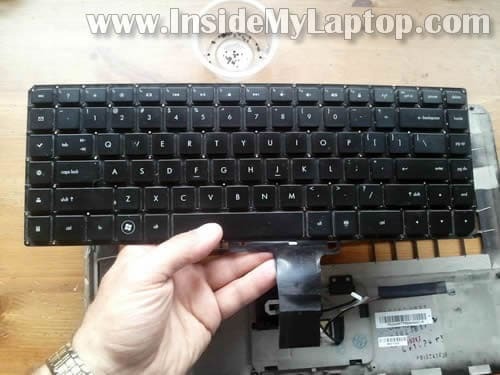 The keyboard is mounted to the top cover assembly and covered with black protective film. Remove 60 (yes, sixty) tiny screws securing the keyboard to the top cover. 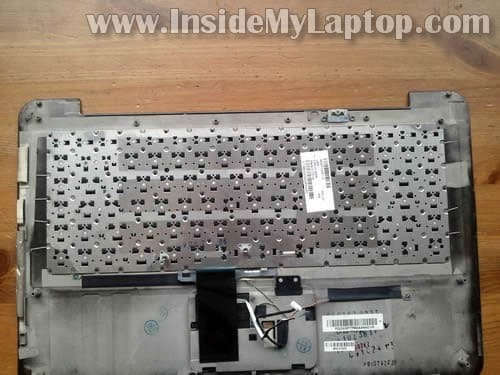 After all screws removed, you’ll be able to lift up and remove the keyboard. You can search for a new keyboard using the HP part number. Hi! First of all very thanks for your work and dedication!! I find very useful your posts and tips. I tried with 3 differents original Windows 7 discs and from an USB pendrive with the system and 3 different optical units too. Always having the same message. I have also tried with a Vista disc, trying to recover system, then chosing command prompt and in this moment changing the Windows Vista disc for the Windows 7 disc and executing x:\sources\setup. I got the same result. The solution of the Vista disc worked for me time ago with the installation of Windows 7 in a computer of a friend, but this time there´s no way to make it run. Have you any clue why this problem is happening to me, someone can help?? Sorry about my English, i´m from Spain, i know my english can be improved. Thanks !! Are you replacing a regular hard drive with SSD? 1. 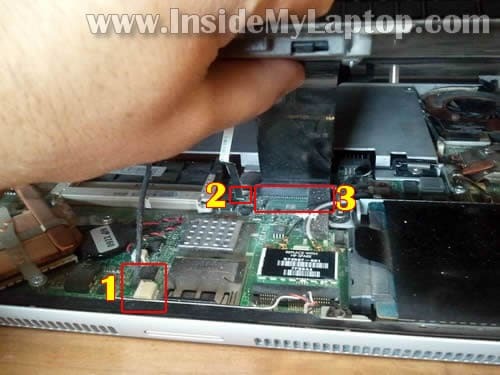 Remove new hard drive from the laptop and connect it to any other PC. 2. If the hard drive has partition, try removing it. 3. If the hard drive has no partition, try creating a new partition and format the drive. After trying different options, try installing the hard drive back into the laptop and run Windows 7 installation disc again. I had a similar problem once when I installed a 64GB SSD from Crucial. This problem was driving me crazy. One of the above mentioned problem helped me (I cannot explain why). Hi, thanks for the quick answer! I tried your solution but the problem remains. The HDD is standard, not SSD: Samsung HM500JI (500GB,5400 rpm,8M). The original one is an Hitachi 7K500-500 HTS725050A9A364, 7200rpm. I don´t think using different HDD is the source of the problem but, who knows? The most irritating for me is when trying from usb pendrive also have this problem!! even if i don´t have an optical drive connected!!! I don´t know what to do with this problem…is driving me crazy. If someone knows a solution, please post it!! Thanks in advance, and again: thank you very much for you help IML Tech!! This is a common problem. You need to download the Intel SATA raid controller driver and install it at the point it asks during the install. The next problem you will encounter once your os is installed is the video driver issue. This is a common problem. You need to download the Intel SATA raid controller driver and install it at the point it asks during the install. That’s a good point. It does sound like a problem with the SATA controller but isn’t it imbedded into the Windows Vista or Windows 7 installation disc? I remember times when you had to manually load SATA driver from a floppy disk while installing Windows 2000 or Windows XP but I’ve never had to do it with Windows Vista or Windows 7 and I install hundreds OS on hundreds different laptops. 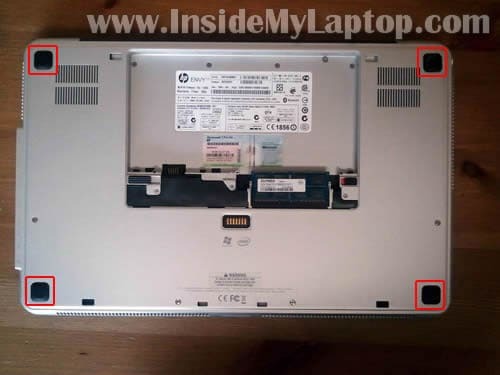 I’ve checked available drivers for HP Envy 15 notebook and I don’t see any SATA controller driver. Here’s one more thing to try. Enter the BIOS setup menu and try loading default settings. Save them and try installing OS again. 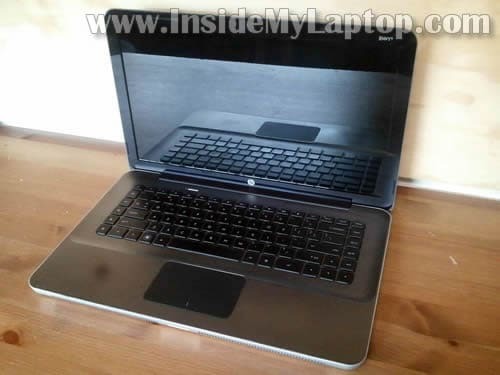 They are talking about a different laptop model but probably you can use same solution. Hi and thanks for the help! I apreciate a lot !! I have try using chipset drivers downloaded from official HP site following the method of the link but i´m unable to load this drivers because windows installer doesn´t recognize the unit from which i´m trying to load them. Hello again! I finally make it works! Although the solution is a little bit “twisted”, and not all the people will have the necessary parts/components to make it work. But at least is a valid solution! After a lot of problems and testing i finally did it. I used an hp pavillion dv6 2150es HDD (it has the same Hitachi hdd than the envy 15) and i cloned it in my new samsung hdd. Of course i had to install some drivers (usb 3.0 and others), and i lost the recovery options from the initial boot of the computer but anyway the system is working perfectly again, and that´s what i wanted. No blue screens, no problem at all until now, hope keep this way. I think if you can use any hdd with system installed with an intel cpu of the same family and similar chipset you can make it work! 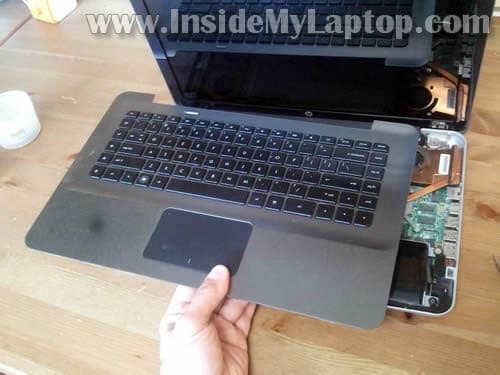 You have to have this, i know not all the people have this possibility, but at least is an option to have your laptop working again. Maybe the last HP laptop we see for a while if the news is anything to go by. They’ve been nothing but trouble though with the video chip fault they all seem to develop. Perhaps it’d be ideal to tell people that they are going to need VERY small screwdrivers to actually get out the screws. Perhaps it’s not very difficult to figure out. Hello Could somebody to help me. 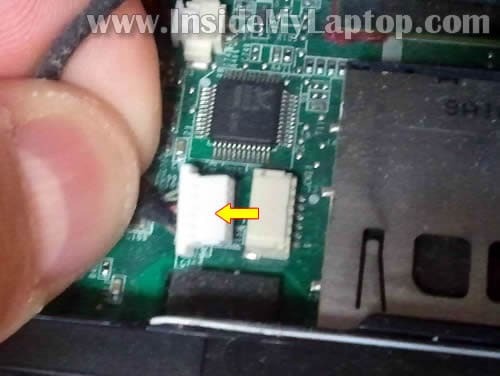 I broked my touchpad ribbon cable on my Hp Envy 15 loptop, so i try to byu another on but i don ‘t know serial number of the cable ? 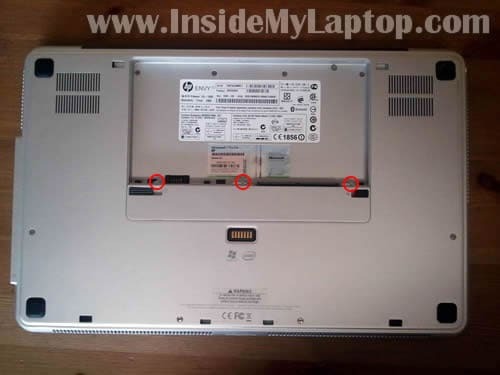 or similar loptop cable can be exist ? 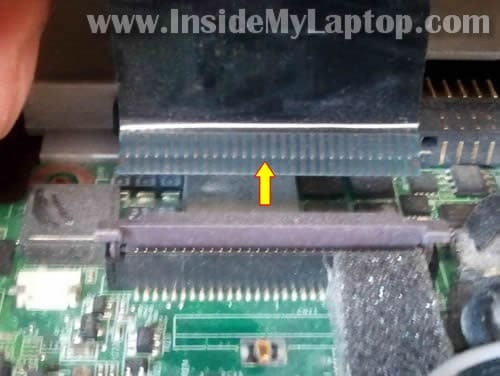 I broked my touchpad ribbon cable on my Hp Envy 15 loptop, so i try to byu another on but i don ‘t know serial number of the cable ? 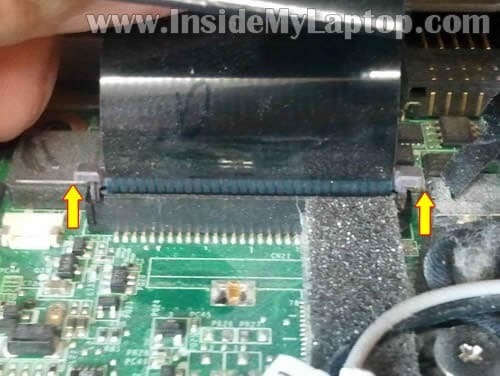 or similar loptop cable can be exist ? I don’t think you can buy a cable separately. 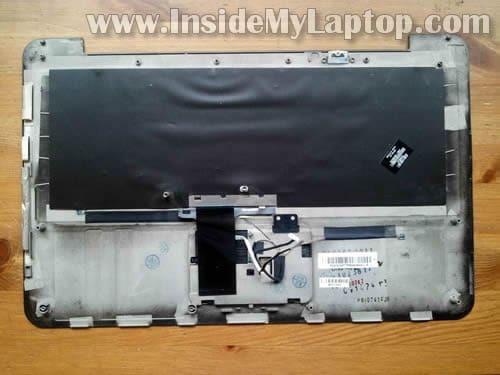 Most likely the touchpad is part of the top cover assembly (palmrest assembly). You can search on eBay for a replacement top cover. What kind of screwdriver I need to remove the 60 screws that are on the keyboard? I was using Wiha PH00 Phillips screwdriver. Thanks for the quick reply. 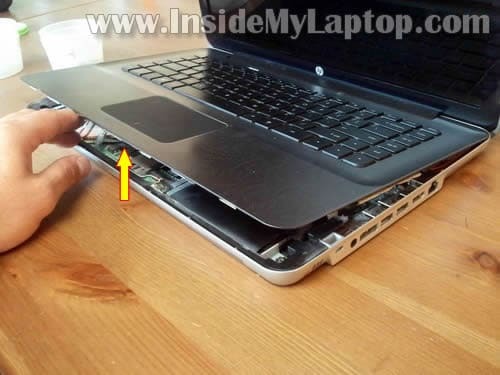 This helps – I had opened up my laptop and was stuck at removing those screws! Will it be ok if I reuse the original mylar sheet? I ordered the replacement keyboard from ebay since I am in India now and they sent me just the keyboard – no mylar sheet or screws. I need a control keyboard and a control keypad for use in Saudi Arabia and United Kingdom urgently , so reply asap ! This was an outstanding tutorial with great pictures. Very helpful! Thanks for posting. My envy 15 will not come on. Wen I press the power button, the wifi light blinks once and that’s all. Av tried removing the battery and putting it back but still won’t come on besides the wifi indicator blinking once on the keyboard. Any ideas on how I can get around this? Would be very grateful. This could be memory related failure. Try reseating both memory modules. 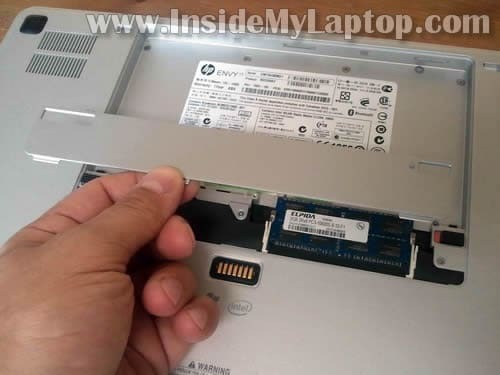 Try turning on the laptop with only one memory module installed.